Someone should have warned the elegant and famously wealthy socialites of New York not to reveal their deepest secrets to the famous author and scandal-loving gossiper, Truman Capote! Years earlier, Capote had been welcomed into their fold and became their treasured confidante. The result was a story that shook high society and ended close friendships. “La Côte Basque 1965” was published in 1975 by Esquire magazine as a preview chapter of Answered Prayers, Capote’s last and unfinished novel. Capote had been gathering material for years about this social set and in it, he held nothing back. The Swans of Fifth Avenue is the fictionalized account of Capote’s friendship with six women, Babe Paley, Slim Keith, Pamela Harriman, Marella Agnelli, Gloria Guinness and CZ Guest. Capote arrived on the New York social scene in the fifties and became fast friends with these ladies, especially Babe Paley, who was married to CBS founder, Bill Paley. High society did not know what to think of Capote’s unusual and flamboyant style, but they took to him because he was so much fun. And the husbands didn’t mind because his homosexuality made him a safe companion. But, although Capote was often the life of the party, he was also a well-respected author of short fiction and several novels, including Breakfast at Tiffany’s. His masterpiece, In Cold Blood, was still to come. The women were known as Capote’s swans, and spent their days shopping, having luncheons, attending galas and retreating to vacation homes. Wherever they went, they were impeccably dressed and ready to be photographed at any angle. Many of the swans, especially Babe, considered it their jobs to look perfect. It was serious business being a trophy wife: the women had no earning power other than being bred to marry a rich husband. In particular, Benjamin portrays Babe as a lonely and insecure woman, whose husband, a notorious womanizer, valued her beauty, but only as a means to elevate his status. Separate bedrooms underscored their lack of intimacy and, desperate for his affection, Babe was intent on being perfect and creating the perfect home. She left no detail to chance, anticipating her husband’s every need, even when he hardly noticed. For Babe, Truman came at the right time, filling a painful void. The Swans of Fifth Avenue is a highly entertaining account of a period of time in New York that hit its peak just as Capote did. And as Capote began his slide into alcohol and drug abuse, the swans became matrons and had to move aside for a new generation. Benjamin feeds the reader’s need to admire the fashion and lifestyles of the super wealthy, while also showing its emptiness and sadness. Marriage is never till death do us part, and while Babe stays married to Bill, the other swans have affairs, marry, and divorce several times over. Of course, the swans spent money like no one else and so the question is: how much can the average reader feel sorry for them? They certainly enjoyed the power and attention that their status gave them and the many pictures from the society pages suggest they knew exactly what they were doing, even Babe. In addition, Benjamin presents a fascinating portrait of Truman Capote and his distinct sides, as both pet and confidante as well as a serious writer. I highly recommend The Swans of Fifth Avenue to readers who enjoy character studies and stories about the New York upper class. Thomas McNulty and John Cole are just boys in the 1840s when they meet under a hedge in a Missouri rainstorm. McNulty is an orphan from Ireland and Cole, from New England, has been on his own for a couple years. They know they will fare better if they stick together. A strong friendship protects McNulty and Cole during their early days as dancers in a miners’ saloon and later as soldiers in the Indian wars and the Civil War. Questions of morality, faith, and fate run through McNulty’s poetic narrative in a style like nothing else, mastered by Sebastian Barry. It’s an impressive feat that a writer can take a piece of ugly American history and throw a moving balance between love, friendship, honor and duty and the brutal violence that comes with following orders. Together they enlist in the army, travel endless days and nights and are charged with the dirty business of clearing the western land of Native Americans. Fierce battles between their troops and tribes from the Sioux make the reader question again the senseless killings and how soldiers, many with nowhere else to go, must reconcile their actions with a need to survive. McNulty wonders if God is looking out for him. He’s never sure. The world got a lot of people in it, and when it comes to slaughter and famine, whether we’re to live or die, it don’t care much either way. The world got so many it don’t need to. Somehow McNulty and Cole survive the Indian wars, but not without deep scars and their time fighting the Rebels during the Civil War presents them with many of the same moral dilemmas, especially when they come face-to-face with their enemies. There’s no soldier don’t have a queer little spot in his wretched heart for his enemy, that’s just a fact. Maybe only on account of him being alive in the same place and the same time and we are all just customers of the same three-card trickster. And despite the ugly time period, the men form strong bonds with their commanders and fellow soldiers, for it is in battle that characters are formed. Bonds break, however, when unspeakable violence causes Barry’s characters to look out for themselves, the point at which the story changes from broad battles to personal struggles. The only solace McNulty finds is in his deep love for Cole, and for Winona, their adopted Sioux orphan girl. The men in their camp and the people they meet later accept both Winona and their gay relationship, a surprisingly modern portrayal that represents one of the author’s important themes: acceptance. Through McNulty, Barry shows a complicated country of diverse backgrounds and cultures, trying only to survive, but willing to defend themselves to the death. Life wants you to go down and suffer far as I can see. You gotta dance around all that. McNulty’s character is a genius and eloquent storyteller, with poetic insights that explain love from all sides. I highly recommend this terrific book. While short (259 pages), you will not want to rush through it because Barry has carefully chosen every meaningful word. I had not read anything by Sebastian Barry before this, but he is a well-known and highly respected Irish poet, playwright and novelist. He has won many awards, is a two-time Man Booker Prize finalist and has won the Costa Book of the Year prize for Days Without End (2016) as well as his 2005 novel, A Long Long Way. It’s 1894 and Mary Handley, New York’s first female detective, has a lot on her plate in this clever historical mystery, the third in the series which features Handley as a fearless and modern-thinking independent woman during a time of major growth and social change. The story begins when Brian Murphy hires Mary to find out whether his wife is having an affair. Simple enough until she finds out what the wife is up to, which pertains to the real attempted assassination of Wall Street magnate and railroad titan Russell Sage. A second case brings Mary face-to-face with powerful industrialists, career politicians and corrupt police investigators involved in a highly publicized murder case and all mired in the complex machine that defines turn-of-the-century New York. Mary’s new case focuses on the actual murder of Carrie Brown, a prostitute who was brutally killed in the city’s East River Hotel. Rumors were that Jack the Ripper had come to America and NYPD Inspector Thomas F. Byrnes was under pressure to solve the crime quickly. The evidence was circumstantial, but an Algerian named Ameer Ben Ali, who was a regular the hotel, was convicted and sent to prison for life. Mary gets involved when Ameer Ben Ali’s brother hires her to find out the real story. Much of the investigation takes place on Coney Island, Brooklyn’s last stop, which at the time was the largest amusement park and resort destination in the United States. It attracted all types, wealthy vacationers, immigrants and working-class visitors. It was a perfect place to disappear or hide a crime and when another woman is murdered, this time Meg Parker, a black prostitute from the Gut section of Coney Island, Mary wonders if there is a connection to Carrie Brown’s murder. Subsequent murders that follow a pattern make Mary’s investigation a race against the clock, including the whereabouts of a mysterious man with blond hair. To connect the dots, Mary turns to her old boss, Superintendent Campbell and her police officer brother Sean, who put their jobs at risk to help their favorite lady detective. I enjoyed this new story, which includes many of the city’s actual movers of the time, including Sage, Andrew Carnegie, Teddy Roosevelt, social reform photographer Jacob Riis and Captain Alexander “Clubber” Williams, a corrupt police inspector whose interrogation methods became known as the “third degree.” Levy does a great job showing what New York was like during the 1890s, highlighting the very topical prejudices and difficulties for the immigrant population. Racism and anti-Semitism as well as hatred towards different cultures, especially Arabs, were common and Levy does not hold back when he depicts these beliefs in several uncomfortable scenes. The author balances these and other gritty, adult scenes with the light banter between Mary and her new love interest, reporter Harper Lloyd. Readers will also like learning more about Mary and her family dynamics, including her very likable father who works in a butcher shop and her meddling mother who wants nothing more than to see Mary settled. This story line reflects an optimism among Mary’s family, despite the prejudices, danger and violence that surrounds them. I recommend Last Stop in Brooklyn to readers who like imagining what historical figures were like and who enjoy the intrigue of an entertaining mystery. I received a copy of Last Stop in Brooklyn from NetGalley in exchange for an honest review. In this historical fiction novel, Tatjana Soli paints a very detailed picture of Cambodia in South Vietnam from 1963 – 1975. The story revolves around Helen Adams, a young American photographer who travels to Cambodia in an effort to both prove herself as a woman in a male-dominated profession and to gain understanding of her brother’s recent death in combat. She immerses herself in her job and becomes enamored of the Vietnamese culture. That pull keeps her in Cambodia long after others leave. It wouldn’t be enough of a story without romance, so Soli adds the seasoned Sam Darrow, a self-absorbed Pulitzer Prize winner, and Linh, Darrow’s Vietnamese assistant. Helen, Darrow and Linh join U.S. army troops on their missions to secure villages and they photograph the atrocities of the war. Their personal relationships grow and change, all the way to the final pages of the book. I enjoyed this story, but Soli’s writing style is a little terse and that can get in the way of the flow of the novel. She is best at describing the scenery, the action and the historical backdrop. But the characters in this book are less developed. I also found some of the scenes hard to believe, when troops are fired upon and Helen jumps into the action, the first to reach a wounded soldier, the one to wipe his brow and tell him he’s going to be okay. She’s up in helicopters, transport planes, doing the army crawl, crouch-running and rolling and jumping into bunkers, just as grenades and bombs explode. These scenes do provide excitement, however. All in all, The Lotus Eaters is an enjoyable read, with an interesting historical backdrop. What’s it about? A realistic look into the public and private lives of Anne Morrow and her famous aviator husband, Charles Lindbergh. Melanie Benjamin takes on a well-known subject and fills in the gaps by letting the reader imagine how Morrow felt during her early marriage and later when Charles left her and their five children alone for long stretches. Benjamin also describes how Lindbergh’s career changes as flight technology advances and he takes on more advisory roles. His pro-Nazi comments made him a controversial figure in the late 1930s and his alliance with Henry Ford, a known anti-Semite, made him extremely unpopular during this time and ruined his long friendship with the Guggenheims. How did you hear about it? I always have my eye out for stories about Charles Lindbergh because of the bigger story behind the glamour of his aviator feats, especially the media sensation during the Lindbergh baby kidnapping. I also read Gift from the Sea by Anne Morrow Lindbergh years ago and liked learning about Morrow’s life and her ideas. This was before I knew about Lindbergh’s double life in Europe, in which he had long-term relationships with three women and fathered two children with one and another with a sister. 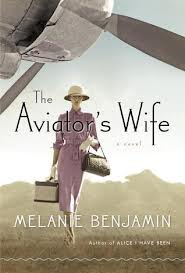 I wanted to read The Aviator’s Wife to learn more about Anne Morrow. Closing comments: So many times the people who do great things are selfishly focused, unable to see either left or right, only straight ahead. I think this must be how Charles was. Anne found her own way to shine, by being a mother, by writing and by forming her own important relationships. In the end, Benjamin gives us a realistic picture of what might have been said between Anne and Charles throughout their marriage and during Charles’ final days. The Light Between Oceans by M. L. Stedman – great movie too! The Light Between Oceans – a great story on the pages and on the screen! It’s a win-win when a movie adaptation is just as good as the book and I found this out when I watched The Light Between Oceans starring Michael Fassbender and Alicia Vikander. Set on an island off Western Australia just after World War I, it’s the story of a lighthouse keeper and his wife, who live alone on Janus Rock. One day, they discover a boat that has washed ashore, carrying a dead man and a crying baby. Heartbroken over their own losses, they are faced with a decision that will shape the rest of their lives. Despite being isolated from the world, it’s no surprise that Tom and Isabel Sherbourne’s choice ultimately affects a great many people and a complicated story emerges. It is a story of love, marriage, family and sacrifice. Terrific filming and a great moral dilemma make this movie a satisfying tear-jerker and I felt the heartstrings being pulled from many directions. Read the book first and watch the movie second? I think it can be done in either order! Click here for a more detailed review of The Light Between Oceans by M. L. Stedman. What are your favorite film adaptations?